THEY ARE MADE WITH STRENGTH IN MIND AND LOOK GREAT AS WELL! Whatever you're looking for, chances are you can find the right deal on the right wheels, right here. SPECIAL TEETH PROFILE FOR EASY CHANGING. The SRAM S600 8 Speed Triple Square Taper Chainset labels and finish mesh perfectly with SRAM drivetrain families. Forged arms increases the strength and reliability paired with our smooth shifting 8, 9 speed 42,32,22 tooth chainrings give you the best combination of looks, performance and price. Coming in the classic square BB interfaces this intended to compliment SRAM's X4 and X5 Families. Sunrace replacement chainset FCM300 48/38/28. Color options: Black, Silver. Wide variety of chain case choices. Wheels & Tyres. Why Buy From Us. Food & Nutrition. Available with chain guard or without chain guard. Wide variety of choices: 44-32-22T/48-36-26T. CW50 CHAINSET 48/38/28T 24 SPEED COMPATIBLE. Etc Chainset. RENOWNED FOR BICYCLE COMPONENTS ETC BRING. Left Hand Crank Arm Included. 48/38/28 Teeth Steel Triple. Whatever you're looking for, chances are you can find the right deal on the right wheels, right here. ETC Steel Triple Chainset Alloy / Steel with Guard. 28 /38 /48 teeth ratio. For square tapered bottom bracket. Black Alloy / Steel boxed item. RENOWNED FOR BICYCLE COMPONENTS, ETC BRING YOU THIS HIGH QUALITY BIKE CYCLE ECW010 CHAINSET 48 / 38 /28 24 SPEED COMPATIBLE. ETC ETC Chainset. Black 170mm. Whatever you're looking for, chances are you can find the right deal on the right wheels, right here. Cheap mountain Bicycle bike Chainset 22/32/42 Black 170mm Cranks chain set. Chainset Black. Size 22/32/42 Chainrings x 170mm Crank Arms. Colour Black. Can't find what your looking for?. FCM33 Crankset / Chainset. Crank Arm Length: 170mm. Square Taper Interface. Aluminum Crank Arms. Square Crank Arm hole rather than diamond. Supplied with crank arm bolt dust cap covers. 7 / 8 SPEED. Compatible bottom bracket: 113mm (Square Tapered). Gears & Drive Train. Compatible speed: 27S. Inner ring: Black steel. Middle ring: Black steel. Outer ring: Black alloy. Finish: Painted black. LOOK OUT FOR OUR DEALS THEY DON'T LAST LONG. Steel/Alloy Triple chainset with Chain Guard. Key Features: 170mm Crank Arm 28/38/48 Teeth set up . 170mm CRANK ARM. TRIPLE CHAINWHEEL (3 CHAINRINGS). COLOUR: BLACK. NO LEFT ARM. Shimano Acera FC-M371 chainset. 44 / 32 / 22T -. Chainset 28/38/48 Tooth Black. 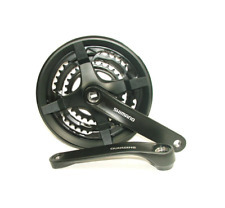 Shimano Chainset Black. Size 28/38/48 Chainrings x 170mm Crank Arms. Colour Black. Can't find what your looking for?. Got everything you need?.